A personal will form, as its name says records information about an individual’s personal wishes regarding the distributions of his/her property and assets. The stated information will be effective after the death of the concerned person or if he/she becomes medically disabled to take any responsibility. The form also notifies the distribution of the responsibilities among the trust persons. The content of the form is designed according to the law of a state. 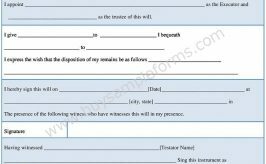 A sample of a personal will form contains information regarding the personal details of the concerned person and his/her wishes related the managing of the property after the death. The form must contain the terms and conditions of such distribution. The sample format of the last will and testament also contains the residuary clause example and you can use it as per your needs. You can also fill up the easy wills online form. 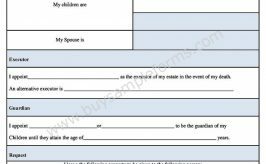 A basic will template is available in both PDF and word format. You can download the form as per your needs.